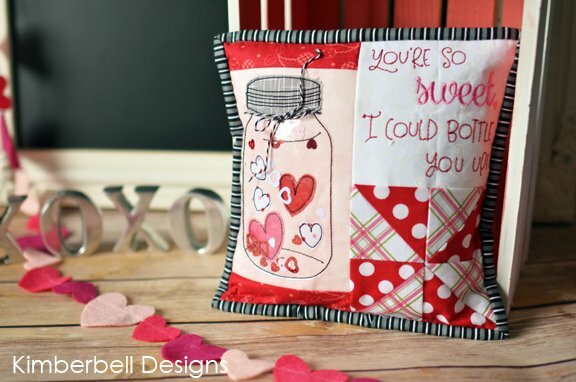 This adorable mini pillow finishes at 8" x 8" and features a vinyl jar full of hearts with the stitched phrase "You're so sweet, I could bottle you up!" Makes a perfect "bench buddy" for the larger Kimberbell bench pillows, or totally sweet on its own! This is a Machine Embroidery project - please bring your embroidery machine. Must also purchase the Kimberbell Bench Buddies January-April pattern (embroidery version - comes with CD that contains embroidery files, PDF directions, and SVG cutting files). Please have all of your fabric selected and cut before you arrive to class. We also carry the full line of "Kimberbellishments" (such as tassels, pom poms, ribbons, glitter sheets) to add those darling details!